"No-mess meatballs! 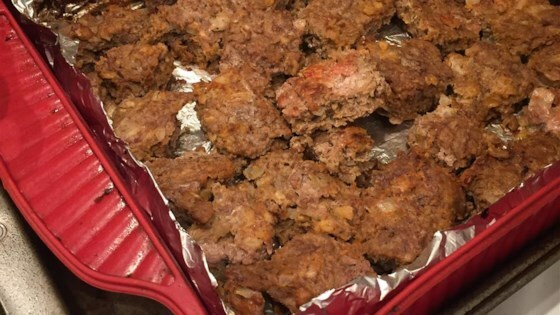 Just pat the meat mixture into a pan and bake… This is a fantastic way to prepare meatballs as I hate mauling the hamburger to make them round balls (less handling of the meat). You can also put your own spin on this by adding the spices you prefer." Preheat an oven to 425 degrees F (220 degrees C). Line a 9x12-inch baking dish with aluminum foil, and spray with nonstick cooking spray. Mix the egg and onion together in a mixing bowl. Add the ketchup and ground beef, then season with pepper, salt, Italian seasoning, and bread crumbs; combine until evenly blended. Place the mixture into the prepared pan, and pat into an 8-inch square. Use a table knife or metal spatula to cut the square into 6 vertical strips, then cut the strips horizontally into 6 pieces each for a total of 36 pieces. Do not separate the pieces, just press through the meat to separate it. Bake in the preheated oven until the meatballs are no longer pink in the center, 20 to 25 minutes. Drain off any grease, and separate the meatballs with a knife to serve. Freeze the meatballs by separating them into recipe-size portions and placing in freezer containers or resealable freezer plastic bags. Freeze for up to 2 months. To thaw, microwave on Defrost for 4 to 6 minutes or until thawed. just made it andddddd love it! Meat mixture was too soupy to hold it's shape, added 3/4 c breadcrumbs. Taste was bland, added plenty of Lawry's Seasoning Salt.